Offering a little extra with your NHL cards, 2016-17 Upper Deck Overtime Hockey is an exclusive promo that comes courtesy of distributors in the United States and Canada. The four-card packs include one insert and a chance at signed cards. 2016-17 Upper Deck Overtime Hockey totals 180 base cards that are split across three waves, each with 60 cards. Wave 1 has Active Stars (40 cards), Retired Greats (10 cards) and Rookie Phenoms (10 cards) subsets. Wave 2 has 40 Active Stars and 20 SP Rookies cards. Wave 3 closes out the main set with another batch of 40 Active Stars and 20 Rookies. Base parallels include Blue Foil (1:2 or 1:2.5 packs), Red Foil (#/99) and Gold Foil Autographs (1:36 packs in Wave 1). While the base set builds with each series, the inserts are specific to the wave in question. 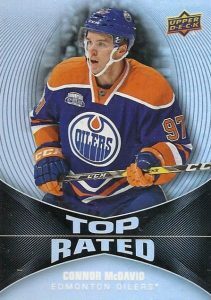 2016-17 Upper Deck Overtime Hockey Wave 1 has a 20-card set for Top Rated. 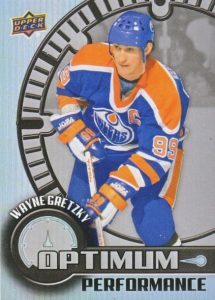 Wave 2 offers Next in Line inserts (30 cards) while Wave 3 adds 20 Optimum Performance inserts. Parallels cover each insert with Blue Rainbow, Red Foil and Gold Rainbow Autographs (#/3) options. There are also Instant Win cards that can be redeemed for free boxes of 2016-17 UD Hockey products such as Series 1, Artifacts and Trilogy. Packs are obtained via purchases through GTS Distribution in the United States or Universal Distribution in Canada. 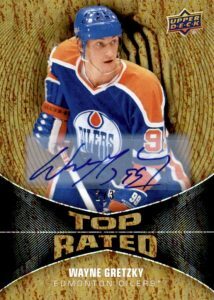 The 2016-17 Upper Deck Overtime Hockey release is broken into waves and based on select product purchases. Each wave of the promo is listed below by the products included and the links take you to detailed set profiles when available. GMA 10 Gem PATRIK LAINE 2016 17 Upper Deck Overtime ROOKIE Insert Next In Line! 180 cards. Wave 1: #1 - #60, Wave 2: #61 - #120, Wave 3: #121 - #180. WAVE 1 PARALLEL CARDS: Blue Foil (Base: 1:2.5 packs; Legends/Rookies: 1:20 packs), Red Foil #/99. WAVE 2 PARALLEL CARDS: Blue Foil (Base - 1:2.5 packs, Rookies - 1:10 packs), Red Foil #/99. WAVE 3 PARALLEL CARDS: Blue Foil (Base - 1:2.5 packs, Rookies - 1:10 packs), Red Foil #/99. Specific group odds noted below for Wave 1. W1 Overall Base Auto Odds - 1:90 packs; Legends - 1:540 packs; Rookies - 1:66 packs. 20 cards. 1 per pack. Wave 1 only. 18 cards. Wave 1 only. 30 cards. 1 per pack. Wave 2 only. 27 cards. Wave 2 only. 20 cards. 1 per pack. Wave 3 only. 19 cards. Serial numbered #/3. Wave 3 only. What are the odds of pulling the instant win cards? A nice gesture from Upper Deck and store owners to reward buyers with free packs. 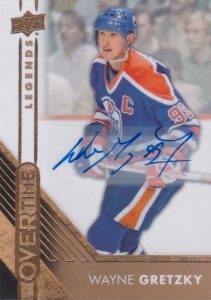 A friend just pulled a Gretzky autographed 2/3. Interesting that Ovechkin didn’t make the entire set. how about odds on wave 3…..? We post everything we have available to us. No odds were provided for Wave 3. Great product as a thank you hard to complain. 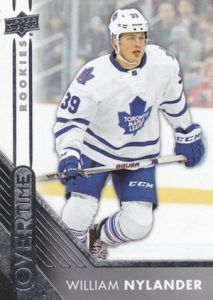 There seems to be no list of base variations for Wave 1, I know of at least one I have two different Anthony Mantha Rookie cards #59, but I’m wondering what other there are and exactly what are the differences in the regular and variation so you can know which one you have.